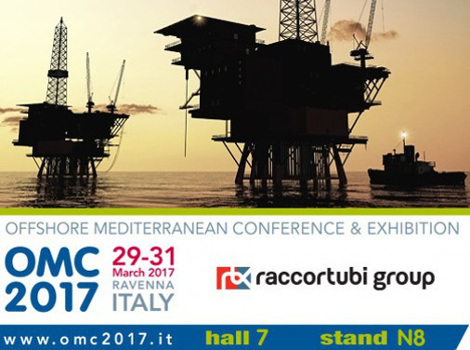 From 29 to 31 March 2017, Raccortubi Group will be exhibiting at the next edition of OMC, Offshore Mediterranean Conference & Exhibition, the traditional Italian Oil & Gas fair taking place every 2 years in Ravenna at Pala De Andrè. It is really a usual appointment for Raccortubi that has been participating in the event since 2011, but at this upcoming edition the Group will showcase interesting news. In fact, Titanium Gr 2 has become an essential part of the company’s warehouse, with fittings produced by its manufacturing plants Petrol Raccord and Tecninox as well as pipes and other components. The exhibition will be, thus, the perfect occasion for Raccortubi to present its broadened offer to the key players of the Oil & Gas industry in the Mediterranean area, who will be able to know all the different solutions the company can provide according to any need for custom tailoring. Do not miss the opportunity to discover more about Raccortubi Group’s product range and visit it at stand N8, hall 7.